A boy who died aged one after NHS staff failed to identify he had septicaemia was "let down", Health Secretary Jeremy Hunt admitted. 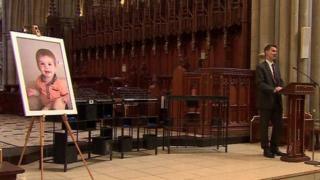 Mr Hunt spoke at a memorial service for William Mead, from Cornwall. William, from Penryn, died in 2014, after an NHS 111 call did not lead to him being admitted to hospital. Speaking at the private service in Truro, Mr Hunt said: "I as health secretary, the government, and the NHS let down William." He also accepted he had let down William's parents Paul and Melissa, who had organised the service at Truro Cathedral as a "thank you" to the local community for their support after their son's death. William's death raised doubts about how able NHS 111 staff were to identify serious medical conditions. Addressing the congregation, Mr Hunt said: "I've come here to say sorry. "This weekend William should have been enjoying beautiful Cornish sunshine with his parents. "We didn't spot his sepsis before it was too late." An inquest heard William's death could have been avoided if he had been admitted to hospital. His death also raised fresh concerns the condition was not being spotted or treated early enough. Mrs Mead, who was involved in creating an awareness campaign for the condition said: "There has been so many people involved in the campaign and they've been pivotal. "Without the government support, without the support of all the organisations we wouldn't be here where we are today and have made the changes we've made". Sepsis: Why can it be so hard to spot?